Dr Katsuya Takasu and the 2016 Nigerian soccer team in Rio. They were training in Atlanta since early July, and expected to fly into Rio de Janeiro a few days prior to the opening of the Olympic Games. But when it was time for the Nigerian soccer squad to leave, they learned that the Nigerian government had not paid for their tickets to Brazil. Days were ticking down to their opening match on August 4, and still tickets had not been secured. Perhaps an indication of financial issues, the Nigerian coach had actually gone unpaid the previous five months. Finally, funds were transferred, tickets were purchased and the Nigerian “dream team” as their fans called them landed in the jungle city of Manaus, Brazil at 2:19 pm on Thursday afternoon. Their first game was to take place less than 7 hours later against Japan. Exhausted, tense from the monumental worry that they might not make it to the stadium in time for their opening match, the Nigerians took the field. And to add insult to injury, the organizers played the wrong national anthem for Nigeria. I watched that game against Japan. I had no idea what the Nigerian team had been through. But I do recall a very fast and energetic match – four goals were scored in the first two minutes, two apiece by each team. One would think, based on what we now know, that Nigeria would have faded into the Brazilian night. But in the second half, Nigeria continued to attack, tacking on three more goals to lead 5-2. Japan would indeed take advantage of Nigeria’s tired legs towards the end to pull within one, but Nigeria emerged victorious 5-4. He’s a cosmetic surgeon, so maybe you can forgive him for creating these somewhat solipsistic commercials. But no doubt, he’s an interesting person. Putting his money where his mouth is, he invested in surgery in his own face to demonstrate how dramatically younger he could make you look. In fact, he recorded his transformation and showed the world how he did it. It’s not a video for the weak of heart. Of course, doctors are known to play golf. Takasu took that to an incredible level by setting a Guinness World Record for a pair of golfers – completing 261 holes in 12 hours (with the aid of a golf cart). But more seriously, Takasu is generous with his money, and has developed a reputation as a philanthropist. In 1995, Takasu organized cosmetic surgeons in the aftermath of the 1995 Great Hanshin earthquake in Japan, which killed over 6,000 people. He arranged for free plastic and reconstructive surgery to victims of the earthquake. When Takasu heard about the plight of the Nigerian Dream Team, he launched into action. He went to the Nigerian Embassy in Tokyo with the intent of asking their help in sending the team USD200,000, with incentive bonuses if they medaled. He realized that it would be better if he hand delivered the contribution, so he promised to fly to Brazil and root them on to victory. 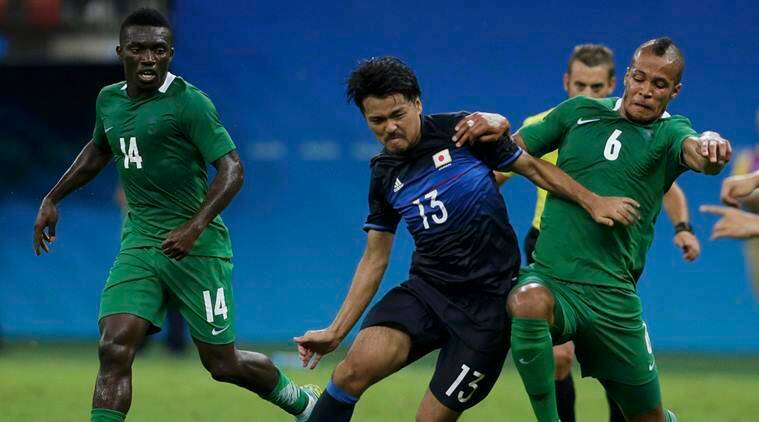 Nigeria beats Japan in soccer in Rio. As it turns out, Nigeria went on to defeat Sweden to make it to the quarterfinals, and then Denmark to make it to the semifinals. They finally lost to Germany, but then defeated Honduras to earn a bronze medal. Takasu arrived to award the Nigerian team a magnanimous sum of USD390,000. The outpouring of gratitude from Nigerians was overwhelming. Oma Akatuba, a German-based Nigerian journalist, said this in his video. This video is specially dedicated to a man who is not a Nigerian, to a man who is not an African, but saw something good in Nigeria. He saw something good in Nigerian football at a time when the Nigerian team at the Olympic Games was completely abandoned by the Minister of Sports, the Nigerian Football Federation, and of course the Nigerian government. This man came into the picture and donated a heavy sum of money to the Dream Team of Nigeria, winning bronze at the just-concluded Olympic Games in Brazil, Rio 2016. His name is Dr Katsuya Takasu. For more enthusiasm from Nigeria, watch this rather entertaining video report from Adeola Fayehun, who begins her broadcast with a joyful “Praise him! Praise him!” in reference to Takasu. Posted in Business, Japan, Pop Culture, Rio Olympics, Soccer and tagged 2016 Rio Olympics, Adeola Fayehun, Katsuya Takasu, Nigerian soccer team, Oma Akatuba, Takasu Clinic. Bookmark the permalink.